Czech national junior coach Miroslav Přerost has trimmed the original 41-man roster, named last month, to 28. It will be down to 23 by the start of the IIHF World U20 Championships in Buffalo, NY on December 26. The roster now includes three goaltenders, 10 defencemen, and 15 forwards. It is expected that two more defenceman and three more forwards will yet be trimmed, although three defenceman and two forwards is also possible. Of the 28 remaining, 14 play in the Czech Republic and 14 in North America. Of the 14 domestic players, 10 play in the Tipsport Extraliga and four play in the First National League. Of the 14 North American players, seven play in the QMJHL, five in the WHL, and two in the OHL. One player remaining on the roster is Martin Frk of the Halifax Mooseheads. Frk, who isn't eligible for the NHL Entry Draft until 2012, wasn't a consideration early on, but earned a spot onto the Czech preliminary roster when Dmitrij Jaškin pulled out with an injury. 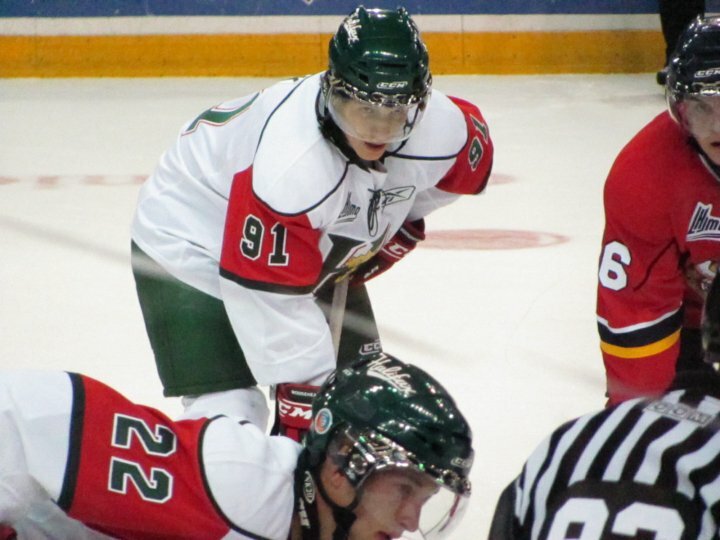 Frk is currently the leading rookie scorer in the QMJHL. There are five returning players from last year's tournament still on the roster. They are goaltender Filip Novotný, defencemen Jakub Jeřábek and Oldřich Horák, and forwards Andrej Nestrašil and Michal Hlinka. Michal Poletín of Slavia Praha was on last year's team that finished 7th, but has now been cut to the team's reserve roster. Of the remaining players, only four have been drafted by NHL teams. Nestrašil in the third round by Detroit in 2009, and taken in 2010 were Petr Mrázek by Detroit in the third round, Jakub Culek by Ottawa and Adam Polášek by Vancouver, both in the fifth round. The players will convene in Detroit for a brief camp starting on December 15 and will play in two pre-tournament games in Rochester, NY before the final 23-man roster is named on December 23. The Czech Republic will open the tournament against Norway on December 27. Marek Mazanec (Plzeň), Filip Novotný (Sparta Praha), Petr Mrázek (Ottawa, OHL). Jakub Jeřábek (Plzeň), Petr Šenkeřík (H. Brod), Dalibor Řezníček, Martin Matějíček (both Zlín), Adam Polášek (P.E.I., QMJHL), Adam Sedlák (Ottawa, OHL), Martin Pláněk (Znojmo), David Musil (Vancouver, WHL), Oldřich Horák (Hradec Králové), Marek Hrbas (Edmonton, WHL). Robin Soudek (Chilliwack, WHL), Roman Horák (Chilliwack, WHL), Andrej Nestrašil (P.E.I., QMJHL), Ondřej Palát (Drummondville, QMJHL), Martin Frk (Halifax, QMJHL), Petr Holík (Zlín), Jakub Orsava (Třinec), Michal Hlinka (Vítkovice), David Tůma (Sparta Praha), Antonín Honejsek (Moose Jaw, WHL), Jakub Culek, Petr Straka (both Rimouski, QMJHL), Tomáš Rachůnek (Znojmo), Tomáš Filippi (Quebec, QMJHL), Radim Heřman (Č. Budějovice). Tadeáš Galanský (Saginaw, OHL), Tomáš Král (Lillehammer, Norsko), Bohumil Jank (Č. Budějovice), Michael Zacpálek (Sparta Praha), Petr Kousalík (Litvínov), Michal Poletín (Slavia Praha), Rostislav Marosz (Třinec), Adam Havlík (Znojmo), Jakub Šlahař (Zlín).